For the longest time, televisions have been in a resolution war. For Pete's sake, we've already heard plenty about 8K TVs. But, soon enough, color will become the new benchmark by which we measure the screen quality. It might sound like an absurd proclamation when 4K is finally gaining traction in the television world just this year. However, after seeing Hisense's new premium Ultra LED 4K TVs, I found myself more blown away by the amazing color rendition than the sharpness of 4K. Now, that's not to say Hisense's latest 65-inch, 4K television is lacking in resolution – it looks plenty sharp with 3,840 x 2,160 pixels. But what makes the 65H10B's picture truly pop is the display's ULED technology, which combines the incredible contrast that 240 lighting zones produces with the accurate, vibrant colors that a quantum dot filter renders. The underlying secret behind Hisense's trumpeted ULED technology breaks down into two parts. Firstly, there's the backlight, which illuminates the screen according to 240 separate zones. In simple English; the more local dimming zones you have, the easier it is to create scenes that are both dark and bright in different parts of the frame. The 240 local dimming zones is huge, especially to help increase the contrast ratio on a 65-inch screen. To put it in perspective, a same-sized 4K TV from Vizio's P-Series only has 64 active LED zones. Both LG and Samsung have withheld the number of local dimming zones built into their highest-end models, the LG65UF7700 and UN65HU9000, respectively. However, from my time with the Hisense, it seemed to produce blacks that were crisper and deeper than those I've seen on most 4K televisions. When it comes to having the highest number of local lighting zones, Vizio has everyone beat, with its 65-inch Reference series TV packing a full array of 384 lighting zones. With an OLED 4K TV, every light-emitting diode acts as its own light source, so you could technically say a screen such as the 65-inch LG EG9600 has 8.29 million lighting zones. Of course black levels are just one part of the equation, the other key piece to the Hisense TV's dramatic picture quality is a quantum dot-laden color filter. 3M Advanced Physics Research Specialist Dave Lamb eloquently explained that quantum dots convert blue light into lower-energy green and red light. "What's special about that light is it's really narrow in its spectral bandwidth," Lamb added. "There are very few wavelengths in there so you get really pure greens and reds." The quantum dots just don't knock out unnecessary blue light, they also help prevent color bleeding and increase the overall color gamut without making the entire picture warmer. This isn't the first time quantum dots have been employed in a 4K TV. 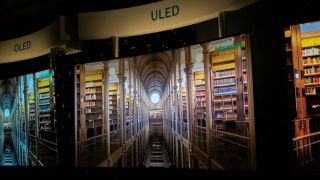 At CES 2015, the technology made its debut in the LG 65-inch UF9400 and Samsung's SUHD Curved TV. In both cases, the quantum dots boosted color accuracy and saturation by 22 to 30%. While it might seem like an overall advance in panel technology, quantum dots are in reality trying to make up for the shortcomings of LCDs. "You actually get less color than you did with CRT," 3M Business Director of Optical Systems Eric Jostes says. "There's still a lot of room for improvement, because current [LCD] TVs only show about 35% of what [color gamut] the human eye can see." Now, the question you might have is, "Why wasn't color a big focus when LCD TVs replaced CRT screens 15 years ago?" According to Jostes, "There was no economic solution available, so no one broke ranks [in the television industry]." But now, Samsung looks to adopt its own quantum dot-based, nano-crystal technology. Meanwhile, LG is delving into OLEDs for screens with improved color. The end result is more vibrant TVs for both existing media and High-Dynamic Range (HDR) content to come. Netfilx has begun rolling out content in 4K, with shows such as Daredevil and House of Cards, but soon it plans to also add HDR shows to its repertoire. Amazon, on the other hand, has already beat Netflix to the punch by making season one of Mozart in the Jungle and the Red Oaks pilot available in HDR format. "Hollywood is more excited about HDR and high-color gamut than 4K, because it's really bandwidth hungry, and [UHD] really does not provide you much bang for the buck," Jostes highlights. "I think we'll see the industry move towards a 20/20 color capability with HDR content." What's next for streaming tech at Netflix?